Aussies love a day out at the beach or to sip a cold drink by the pool, but turning into a red crab at the end of the day makes us wish we put on more sunscreen. We all know Australia faces harsh UV conditions and it certainly is not a secret that sunscreen is a must when heading out for a day in the Aussie sunshine. With such a large choice of different sunscreens available, what extra value does a high sun protection factor (SPF) label bring? Read on to find out the benefits of using SPF 50, how it compares to SPF 30, and which sunscreen brands you may like to consider. Sunscreen aims to filter out the sun’s ultraviolet radiation (UV) which reaches us through two forms – Ultra Violet A (UVA) and Ultra Violet B (UVB). Both UVA and UVB are known to cause skin cancer where UVA contributes to the ageing of skin and UVB contributes to the main cause of sunburn. How SPF works is it calculates the time it takes you to burn with a sunscreen and divides it by the time it takes you to burn without a sunscreen. If you burn in 500 minutes with a sunscreen and 10 minutes without a sunscreen, this would equate to 500/10 = 50, which is a sunscreen with a SPF 50 rating. When applied correctly, it provides 50 times your natural protection, reducing damage to your skin from UV rays. The burning question – what is the difference between SPF 30 and SPF 50? In 2002, a new standard was announced by the Therapeutic Goods Administration, increasing the sun protection index from SPF30+ up to SPF50+. With the changes, sunscreens carrying ‘SPF 30’ are required to have an increased UVA protection in order to be categorised as ‘broad-spectrum’. SPF 50+ filters out 98% of UVB radiation, which is only a slight increase compared to 96.7%. Nevertheless, the increased protection should not be overestimated. All types of sunscreens should be re-applied every two hours and after exercising, swimming or towel drying to retain its full sun protection. Application is the key factor, according to Cancer Council, no matter if you are using SPF30, 30+ or 50+. What SPF 50 Sunscreen is there? Cancer Council has a number of ranges including Ultra, Ultra Cooling, Sport, Kids, Sensitive, Active and Classic. It reminds you of the classic milk ad, when you just want sunscreen that works like real sunscreen. So what should you pick from the Cancer Council SPF50+ range? Ultra: is Cancer Council’s largest range and is claimed to be suitable for all skin types with an advanced formula for extra UV protection. It also has a few specific products, including Cancer Council Ultra Lip Balm, as well as Ultra Roll-On, which is ideal for face, neck and hands. Ultra Cooling: is claimed to have a “cooling” formula that feels cool on the skin while you apply. Sport: along with water resistance, the Cancer Council’s ‘Sport’ range provides sweat resistance and is ideal for watersports. Kids: in this range you will find a fragrance and paraben free variation that is dermatologically tested. Sensitive: Cancer Council’s ‘Sensitive’ sunscreen is also dermatologically tested as well as fragrance and paraben free. It is formulated with Aloe Vera and Vitamin E to moisturise the skin. Active: this line has a light, non-greasy formula for quick drying on hands, in particular for oily skin. You may like to give this one a try for sports such as golf or tennis. 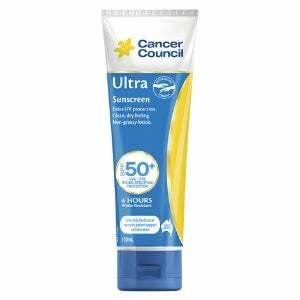 Classic: Cancer Council Classic sunscreen provides a zinc oxide, water-in-oil formula with Aloe Vera, as well as Vitamin E and comes in a tropical scent. The options are there if you want a sunscreen for a specific type of activity or a size variation, otherwise every range provides you with the recommended SPF 50+ protection, considering you are re-applying every two hours or after swimming, towel drying and exercise. It claims to be sweat resistant with four hours water resistance. It is said to be suitable for all skin types and labelled as a UVA/UVB broad spectrum sunscreen. For Hamilton’s spray sunscreen option, it is additionally claimed that it has an invisible and fast drying formula that is non-greasy to help prevent sand sticking on you, something we all don’t enjoy when we are at the beach. Hamilton SPF 50 spray option is also preservative free while other Hamilton sunscreens do use several preservative ingredients. 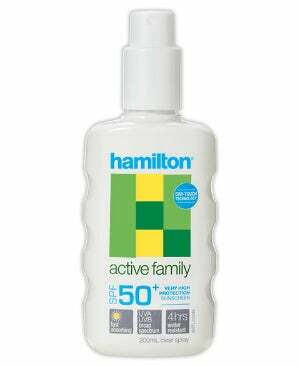 There is also a specific Hamilton SPF 50 sunscreen for babies that you may like to consider. The ALDI Ombra range is claimed to be four hours water resistant. Its kids’ option comes in a blue colour so you can easily see where you’ve applied it to the skin. This is incredibly useful as children’s skin is extremely sensitive to the sun, plus it helps kid’s to look forward to applying sunscreen with the fun colour feature. It comes in a one litre family pack. 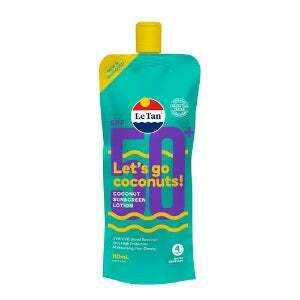 Le Tan sunscreen is Australian-made and owned. Its full range has four hour water resistance and is oxybenzone free. Coconut SPF50+ Aerosol Sunscreen: comes in a 175g spray and has a fresh coconut fragrance. It is also paraben free. SPF50+ Coconut Sunscreen: this line is claimed to not run into your eyes with its water resistance. It also contains coconut water to help hydrate your skin. The 100ml lotion option comes in a unique squeeze pouch format to help empty content completely and reduce on packaging. If you prefer a spray, there is also a 250ml bottle. Invisible SPF50+ Sport Spray: has a non-greasy formula that aims to absorb quickly and provide sweat resistance. It is vegan friendly, paraben free and claimed to be dermatologically tested to suit sensitive skin. It has a light coconut scent and comes in a 200ml spray. SPF50+ Zinc stick: Le Tan also provides a zinc option for broad spectrum protection against premature skin-aging UVA rays and burning UVB rays. There are a couple of ranges in the Neutrogena sunscreen line. Its ‘CoolDry Sport’ and ‘Kids’ sunscreen ranges only provide SPF 30 while its other sunscreens are SPF 50. Its full SPF50 range comes in an oil-free, non comedogenic (won’t clog pores) and PABA free formula. All Neutrogena SPF50 sunscreens also provide four hours water resistance with the exception of Ultra Sheer Face Lotion. Neutrogena Ultra Sheer Body Lotion (85ml): this has a lightweight and non-greasy formula with a matte finish. For the hard-to-reach areas you may also like to try the Neutrogena Ultra Sheer Body Mist (140g) variation, which is claimed to provide continuous spray at any angle. Neutrogena Ultra Sheer Face Lotion (88ml): is a lighter, non-shiny finish formula without water resistance. It provides a matte finish to help keep your face from becoming shiny. 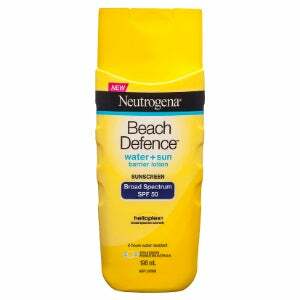 Neutrogena Beach Defence Lotion (198ml): is claimed to be a lightweight and fast absorbing formula. It also claims to provide “beach” strength UVA/UVB sun protection, which helps to protect skin against the drying effects of the beach. It also comes in a Neutrogena Beach Defence Mist (184g) variation for those hard to reach areas. What’s the best sunscreen to use? With sunscreen labelling in Australia strictly regulated by the Therapeutic Goods Administration, you can have confidence that a sunscreen that makes it onto supermarket or pharmacy shelves does what it claims to do. The new standard rejects misleading claims such as ‘water proof’ or ‘sweat proof’, allowing only ‘water resistant’ or ‘sweat resistant’ terms to be used. Going with a sunscreen that is labelled SPF 50 is a great move, especially in Australia where we experience extremely harsh UV conditions. Then again, Cancer Council says that any sunscreen with water-resistance and a sun protection factor of 30 can be used, providing it is also labelled ‘broad spectrum’ and has not passed its expiration date. A large component of SPF protection claimed on the label comes down to its application, so you shouldn’t expect your sunscreen to do its job properly with just a light smear. Stay protected with a combination of sun protection measures including protective hats and clothing, as well as sunglasses and shade. If in doubt, go for SPF 50. Which sunscreen is best for your skin type?